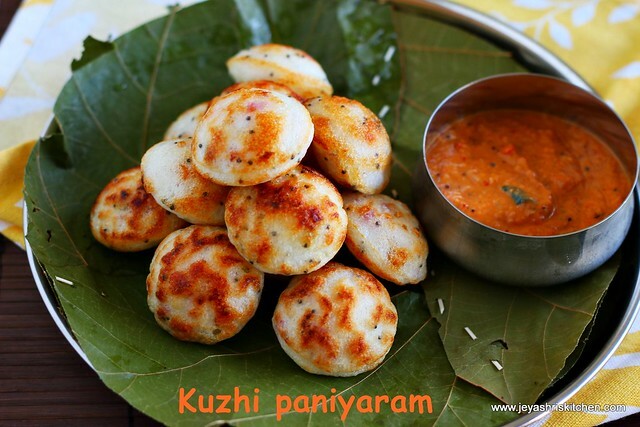 Kuzhi Paniyaram is a common South Indian Breakfast made usually with leftover idli/dosa batter,and even i have made it several times. 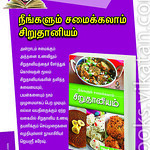 But this time i learnt this from my friend ,who gave me exact recipe of making kuzhi paniyaram in their native place. It turned out so well and it was super soft and fluffy. From that i stopped making paniyarams out of left over idli/dosa batter. 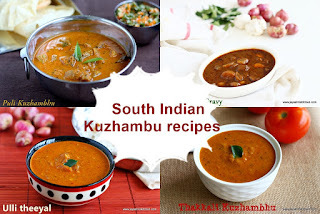 Check out my tomato kuzhi paniyaram and instant rava kuzhi paniyaram. Wash the rice and the urad dal nicely and soak it together along with fenugreek seeds(vendhayam) for 4-5 hours. Grind it smoothly in a wet grinder. Add salt to the batter and ferment it for 6-7 hours. Grind the chillies coarsely and add to the batter. In a kadai, add oil and add the mustard seeds, channa dal and once the channa dal turns nice golden colour add the onions and fry the onions turns pink. Add a pinch of salt to this. If you are adding coconut bits add at this stage. Heat the paniyaram pan an add oil in each holes. Pour the batter , i used an icecream scoop to do this. Keep in a medium flame. Flip this with the help of a fork or the wooden stick which comes with the non stick pan. Serve hot with coconut chutney or spicy red chutney. The batter should be not too thick or too watery.This has to be slightly thin than idli batter,but little thick than the dosa batter. If you want u can add green chillies while grinding the batter itself as we do for vadas. The leftover batter can be used for making dosa as it comes very great. You can replace green chillies with red chilli powder also. 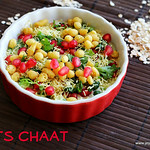 looks awesome and delicious...lovely clicks!! 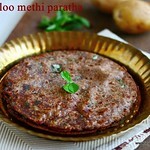 Wow...it looks very tasty...Very nice pics too..
perfect and fluffy paniyaram! !nice click! Awesome snack dear. And a very well designed medley of pics. looks so soft and delicious !!! I love this....looks so yummy... even I make it with different varaiations based on the availability of batter,some times Idli,dosa batter or if I m in good mood make special batter for it.. I love love love it. 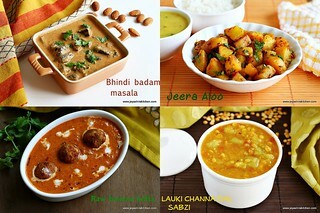 this is truly tempting.. pls pass me some Jeyashri..love the pictures as usual. 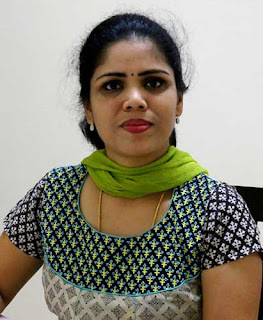 I think you should start a food business Jeyashri,all pictures looks professional and yummy. Look gr8 . Awesome and flufy. Love this paniyaram with coconut chutney for my snacks, yumm! love it with the onions and all..looks yum.. I love these!!! 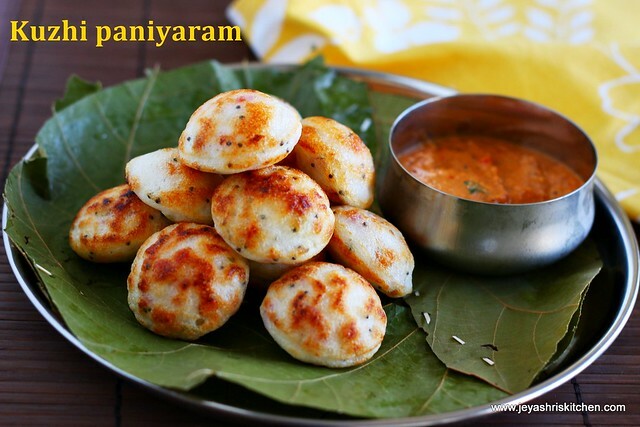 Ur paniyarams looks so soft & perfect..Feel like grabbing some...n very well presented!! 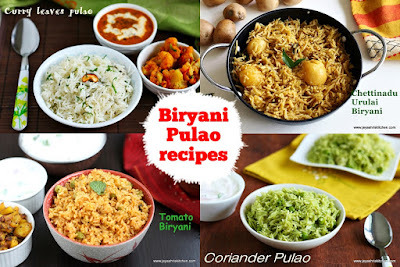 Ahh..I love these n thanks for the wonderful n authentic recipe..will try it! Wow!! Looks tempting...during childhood use to get it from neighbors..have to try this..Yum! Grinding specifically for kuzhi paniyaram does result in softer ones.. i use similar proportions except for urad dhal - only 1/4 cup instead of 1/2 cup. Looks very good Jeyashri. nice and light tiffin....perfect and looks crispy.. 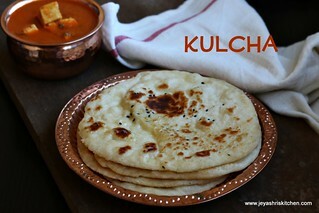 Noted this recipe down...sounds like it will be soft paniyaarams...will try and let you know. I remember having these in childhood at a neighbour's place. Thanks for sharing the lovely recipe. Glad to follow you!! 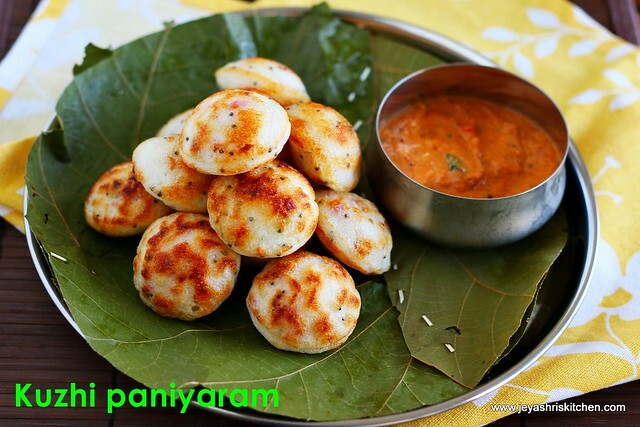 Perfect paniyaram, it looks so yumm and tasty, !!! first time here love your space...Happy to follow you!!! i made this...it was yummy.......i loved it. From where I can buy Paniyaram pan? 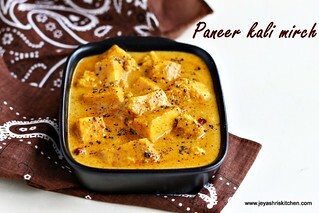 Any alternative ways to cook this..I don't have a pan and i am not sure of where we get this in Canada..